Thanks for your comments on my last post; I love learning more about fashion and I feel quite the expert on chevron, or Missoni, print now. 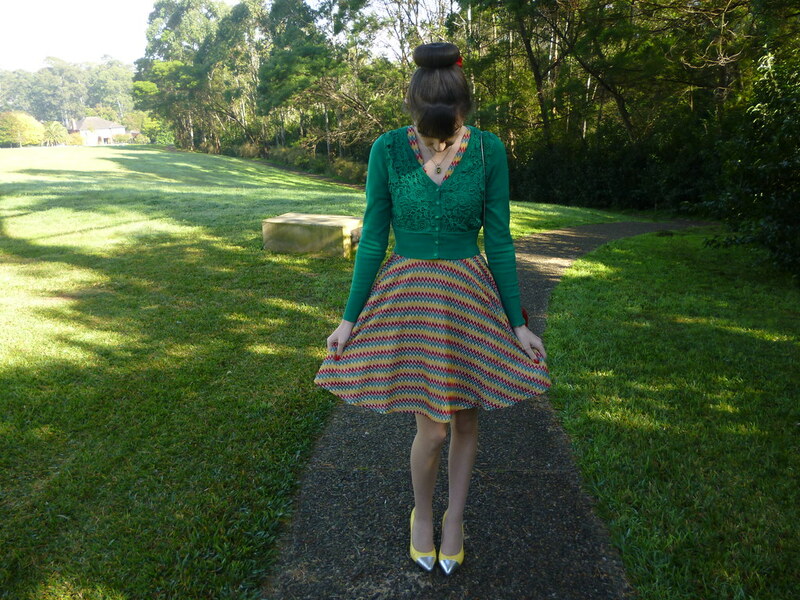 On Sunday I felt inspired to wear my chevron printed dress which I purchased from Modcloth a couple of years ago. It feels great styling a dress that I haven’t worn for ages and maximising the potential of my wardrobe. I realised just how many different possibilities there are for this dress such as white, black, red, green and yellow accessories. When deciding which of my many cardigans to pair with a dress, I often think about which colour would be the most obvious choice. To me, red stands out as the most in this print; I’ve worn my red cardigan with this dress many times and I accessorised with red when I posted here. 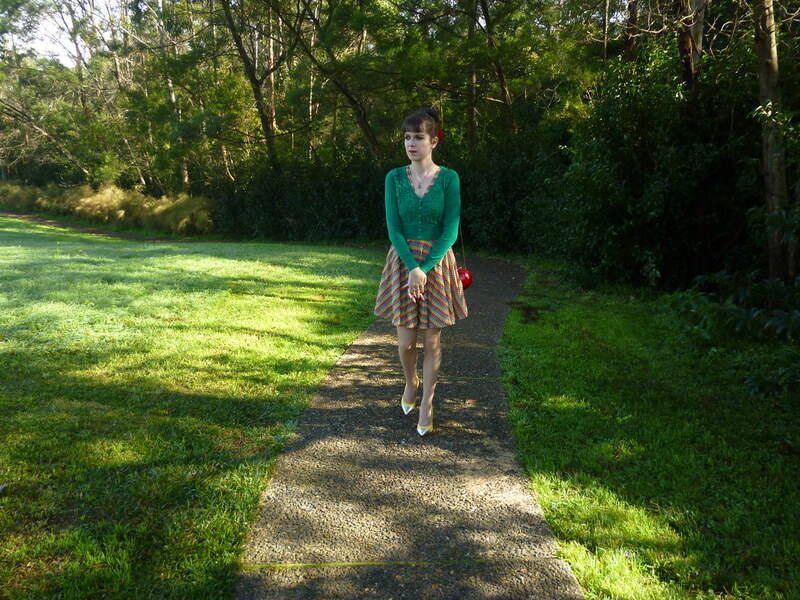 However, sometimes this inspires me to choose a colour, which still matches, but is not necessarily the most obvious choice and that’s how I arrived at this green lace cardigan. In recent times I’ve started to love green especially a beautiful emerald shade; this is evidenced by the fact that I seem to post more green outfits these days here and here. With my love of green in mind I searched my wardrobe for a pair of emerald heels; wishful thinking, I guess I was hoping such shoes would magically just appear. Is it just me, or are green shoes one of the hardest items to find? The closest I have are my Seychelles heals which I posted here but they are much more of a teal shade. Suddenly I thought, why not be more creative and bring out all of the bright and fun colours in this dress? 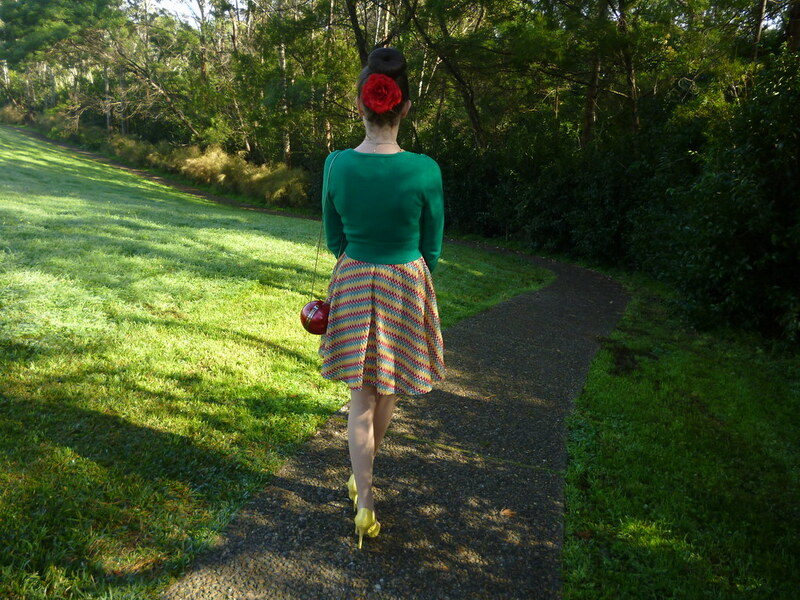 That’s how I arrived at the combination of yellow heels and a red hair flower and bag. I LOVE colour; there can never be too much colour in an outfit I say!I have a few particular bloggers in mind who I believe would agree. A few weeks ago here, I mentioned that I don’t always carry a bag because my husband’s pockets often function as my handbag. After I told him this, he wanted to be featured on my blog too. Just look how big that pocket is at the front; perfect for my camera and Iphone which don’t actually fit in my red circular bag. I thought this would be a good time to post this photo because on Sunday we were almost a matching couple; I’m pretty sure there are some small elements of chevron print in his outfit too. One of the aspects I love about Rydog is his quirky personality and individualistic sense of style. Yes, this is a poncho and yes, it is a woman’s poncho; in fact I quite enjoy wearing it around our apartment since it’s so comfortable. 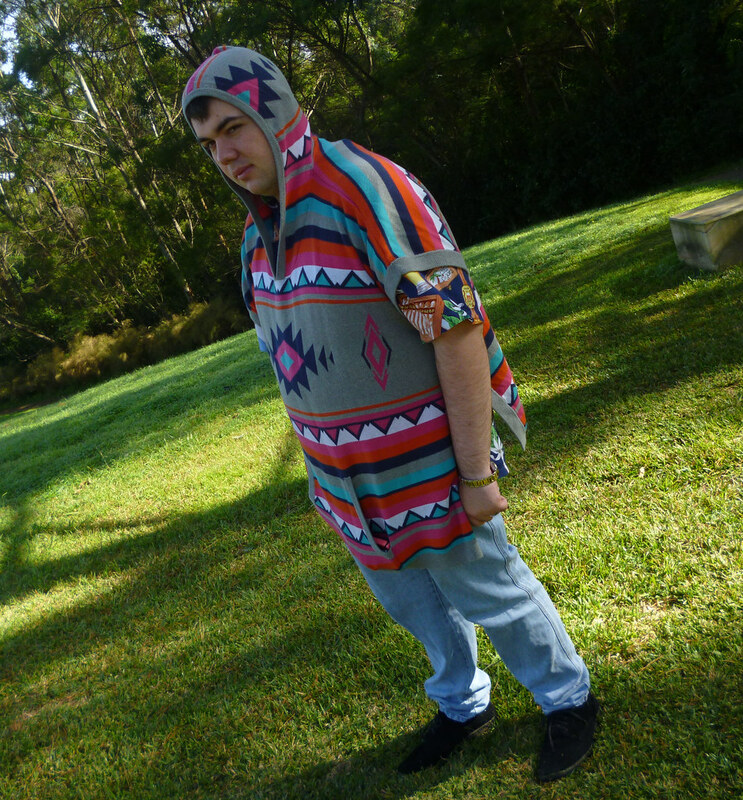 It is such a fun piece, we loved buying it and it’s always great to see other people’s reactions to this very unique poncho. I hope you all had a great weekend. I enjoyed catching up with family including my sisters at The Polished Edge. Check out their blog! 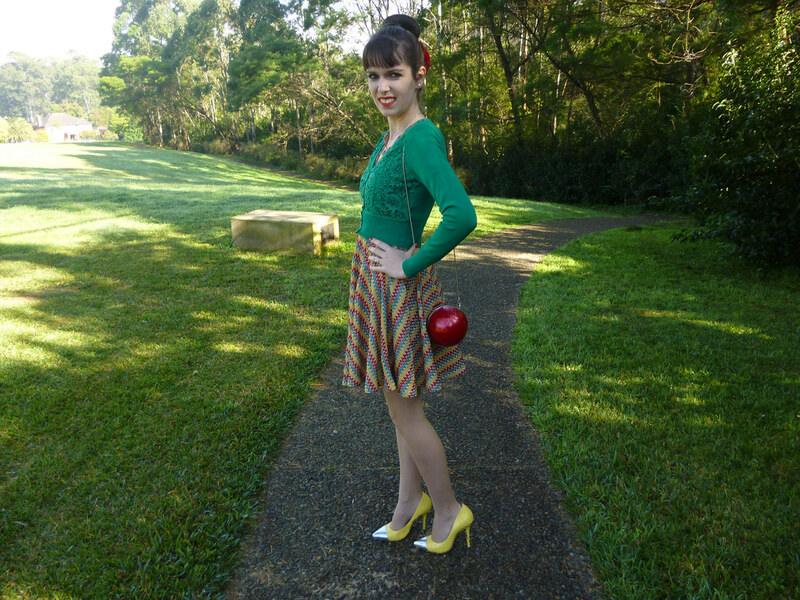 This entry was posted in Alannah Hill, Modcloth, Outfits. Bookmark the permalink. Nice color combination! Love your heels! Congrats! I don´t know many persons who has such a great sense for combinations like you <3 You look so cute, elegant and awesome, everything in the same time! Love all of the color! Emerald is one of my favorites! I totally love your outfit. You look amazing. I appreciate how you write the sweet something along with your outfit pictures. Thanks for visiting my blog. I am a new follower. I am having a super clothing giveaway with Oasap in my blog, come by! I love your outfits! They always look so whimsical! The chevron print dress and the lace cardigan is really pretty. I like the combination of the colors! That is a pretty cool outfit and such unique accessories! What a fabulous and brilliant green sweater! Love that emerald colour! I love the idea to wear green with this dress! 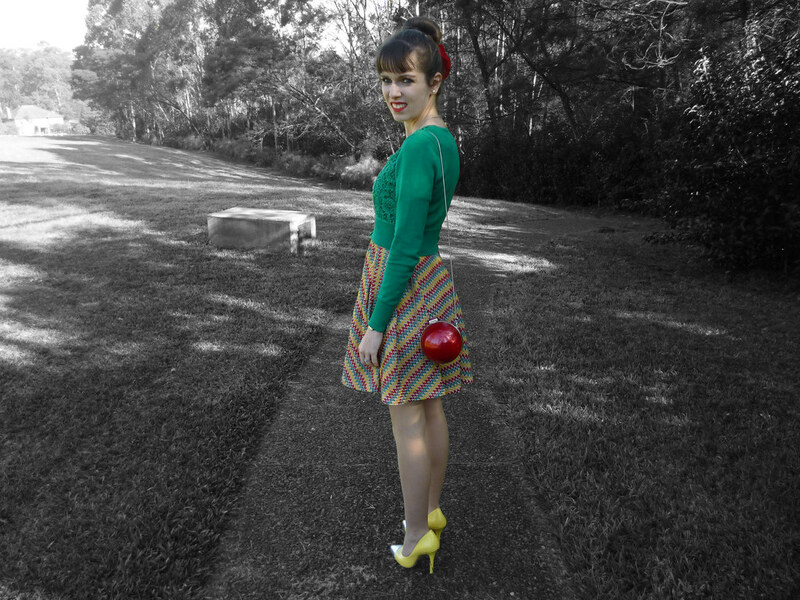 Red is the first color that comes to my mind to pair with it too, but I'll definitely be pairing it with a green cardigan next time! You look gorgeous!